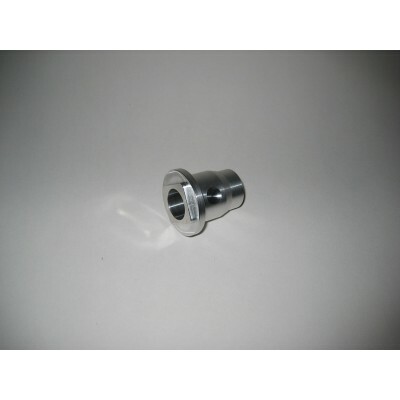 Billet Aluminum Rear Axle Wheel Spacer Skidoo Rev XP - Grip N Rip Racing LLC. These billet aluminum wheel spacers are to replace the weak plastic rear axle wheel spacers. The XP's have very little clearance between the track and tunnel. In order to keep the track from rubbing the tunnel there can't be side to side movement of the track. The rear axle wheels are designed with little to no clearance between the track drive lugs in order to keep the track from moving side to side and rubbing the tunnel. The stock plastic spacers don't support the rear axle well and allow it to flex under load. When the axle bends it's not perpendicular to the rails which causes the rear wheels to not run true on the track. When this happens it puts high side loads on the plastic rear wheels which can cause the wheel to pop off the bearing. It can also increase the rolling resistance of your track because the wheels are not running true on the track. The stock plastic spacers also compress when you tighten the rear axle not allowing the spacers to tightly clamp the rails. When the rear axle isn't tight it causes extra stress on the track adjuster bolts. The adjuster bolts aren't designed to handle this stress and can break on a hard on power landing. Our billet spacers have a large support area and won't allow the rear axle to flex under load. This keeps your wheels perpendicular to the track and running true. They billet spacers also won't compress when tightening the axle and will clamp the rails properly locking the axle in position. If you need your sled to be bullet proof, these billet spacers are the answer. Sold each. You will need one spacer for each wheel on your axle. If you have two wheels you need two spacers. If you have three wheels you need three, and so on. Fits 2008 and newer Skidoo and most other Skidoo models. If your sled takes BRP part # 503190428 this billet spacer will fit. Go to BRP's website http://www.ski-doo.com/en-US/Owner.Center/Parts.htm and lookup your year and model in their parts catalog to find out what your sled has for a spacer part #.